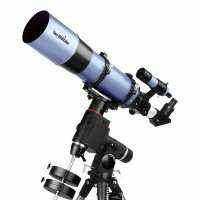 This Sky-Watcher 150mm (4") f/5 telescope is a two-element, air-spaced, fully multi-coated objective, achromatic refractor, which can give exciting "rich field" astronomical views. It can provide excellent vistas of star fields, clusters, nebulae, galaxies, planets, the Moon and (with correct filtering or by projection) the Sun. It is also a fine terrestrial telescope when mounted on an alt-azimuth mount or a photographic tripod. Crisp images at a reasonable price make it an excellent beginner's "first telescope", or a great travelling telescope for a more advanced observer. Similar to the popular 80mm f/5 refractor, this larger aperture model has more light collecting power at the same focal ratio and accepts 2" diagonals for awesome wide field views, while only a small amount to chromatic aberration and weight. Weighing about 3kg. (6.5lbs.) the optical tube assembly is readily carried and with a compressed length of approximately 50cm (21.7") it is easily transported.